Explore map of New Hampshire; the fifth smallest state by land area in the United States. Located in the New England region, New Hampshire covers an area of 9,349 square miles. The state shares its state boundaries with the US states of Vermont and Maine and international borders with the Canadian province of Quebec. Atlantic Ocean is located to the east of Maine. Concord is the capital of Maine, while Manchester is the largest city. It is the 41st most populous state of the country and as of 2016, 1,334,795 people were residing in Maine. Mount Washington, which has a height of around 1916 meters, is the highest point in the state. One of the original 13 states that founded the United States of America, New Hampshire was admitted to the Union on June 21, 1788, as the ninth state. 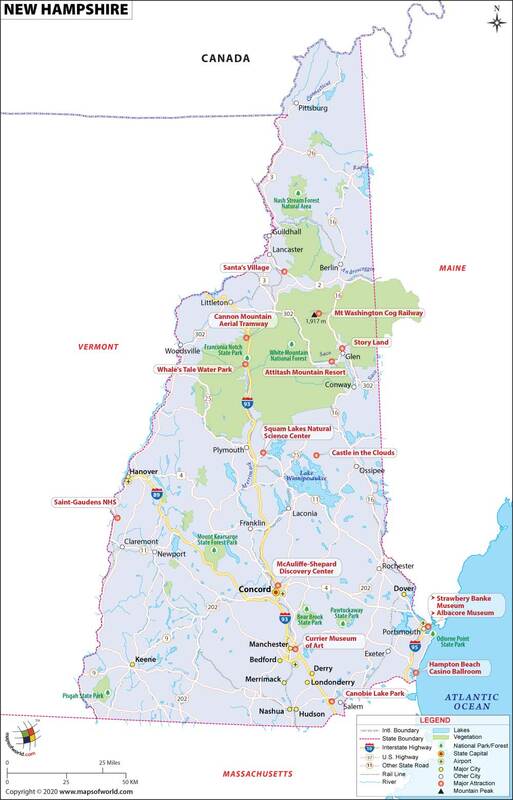 : The map of New Hampshire shows interstate highways 89, 93, and 95 passing through the state. Location of airports near Lebanon, Bedford, Portsmouth and the capital city of Concord are clearly depicted. Major attractions such as Currier Museum of Art, and Santa's Village are also shown. Apart from state parks and White Mountain National Forest, the map also shows Mt. Washington, the highest peak in the region. New Hampshire is located in the New England region of the northeastern United States. Also known as 'The Granite State', it is the 5th smallest and 9th least populous state, with Concord as the capital and Manchester as its largest city. The state has 10 counties. The region was inhabited by Algonquian tribes (Abenaki and Pennacook) before the first European settlers arrived in 1600. After two decades, the Council for New England gave a royal grant to Captain John Mason. In 1629, Mason took the area between Merrimack and Piscataqua and named the colony after English county of Hampshire. The region merged with Massachusetts in 1641 to form a coalition, but was separated in 1680 by order of the King Charles II. In 1699, the two regions were again united, and finally separated for good in 1741. New Hampshire raised three regiments during the American Revolutionary War for the Continental Army. It was the ninth state to ratify the United States Constitution on June 21, 1788. Spread over an area of 9,349 square miles, the state is bordered by Massachusetts in the south, Vermont on the west, Maine and the Pacific Ocean on the east, and Canada's Quebec to the north. The state has seven major regions, which are the Great North Woods, the Lakes region, the White Mountains, the seacoast, the Merrimack Valley, the Monadnock region, and the Dartmouth-Lake Sunapee area. The northern part of the state is made of tree-covered forested lands and in the southeast lies the coastline. New Hampshire has the highest percentage of timberland area in the country, and the shortest ocean coastline of only 18 miles. The New Hampshire region is dominated by the White Mountains. Its highest peak is Mount Washington, which is 6,228 feet above sea level. Between sailing on mountain-ringed lakes and skiing on snowy slopes, seasons dictate tourism in New Hampshire. The state offers plenty of recreational thrills that include snowmobiling, observing the fall foliage, and vacationing in summer cottages. Mount Washington State Park features hiking trails and historical attractions. By Air- Manchester–Boston Regional Airport (MHT) is served by American Eagle, Delta Air Lines, Southwest Airlines, and United Express. By Train- Amtrak operates Vermonter and Downeaster routes through the state. By Road- I-89, I-93, and I-95 are the primary interstate highways in New Hampshire. There are 80 public and 30 private high schools in the state. New Hampshire is also home to Dartmouth College in Hanover, which is a member of the Ivy League schools. The University System of New Hampshire oversees five public universities. The state holds the first primary in the US presidential election cycle. The city of Dover is the oldest permanent settlement in the state. First free public library in the US was established in 1833 in Peterborough, a town in Hillsborough County, New Hampshire.